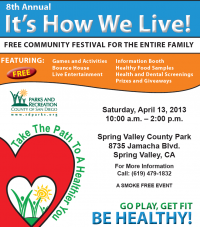 April 11, 2013 (Spring Valley)-- The County of San Diego invites you to "go play, get fit, be healthy!" The 8th annual "It's How We Live" community festival will be held this Saturday, April 13 from 10 a.m. to 2 p.m. at the Spring Valley County Park, 8735 Jamacha Boulevard in Spring Valley. The event is free to the public and includes games, activiites, healthy food samples, free health and dental screenings, a bounce house, live entertainment, information booths, prizes and giveaways. 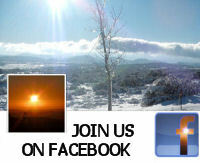 This is a smoke-free event. It is sponsored by the County's Health and Human Services Agency and the Parks and Recreation Department, with support from community organizations. 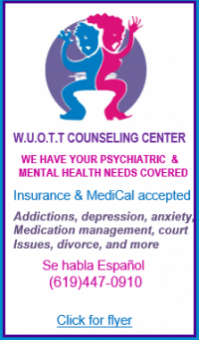 For more information, call (619)479-1832 or see view a flyer.